Seinor Research Fellow at the Institute of Slovenian Literature and Literary Studies, Research Centre of the Slovenian Academy of Sciences and Arts (ZRC SAZU); Assistant Professor at the Postgraduate School ZRC SAZU. In his research, Marijan Dović centres mainly on the literary canon, the systems-theory, the historical avant-garde, Romanticism, authorship and canonization. He has published numerous articles (both in Slovenian and English) and three scientific monographs. As a member of IGEL, EAM, ICLA and the Slovenian Comparative Literature Association, he has organised several conferences devoted to the Slovenian avant-garde, literature and censorship, literary mediation, and the relationship between literature and music. Ed. (w. Jón Karl Helgason): Great Immortality: Studies on European Cultural Sainthood. Leiden: Brill, 2019. Prešeren po Prešernu: kanonizacija nacionalnega pesnika in kulturnega svetnika. Ljubljana: LUD Literatura, 2017. (W. Jón Karl Helgason:) National Poets, Cultural Saints: Canonization and Commemorative Cults of Writers in Europe. Leiden: Brill, 2017. Ed. : National Poets and Romantic (Be)Longing (= Arcadia 52.1 : 1–73). Ed. (w. Gregor Pompe): Literatur und Musik (= TheMa 5.1–2 ). Ed. : Kulturni svetniki in kanonizacija. Ljubljana: Založba ZRC, ZRC SAZU, 2016. Slovenski pisatelj: razvoj vloge literarnega proizvajalca v slovenskem literarnem sistemu. Ljubljana: Založba ZRC, ZRC SAZU, 2007. Sistemske in empirične obravnave literature. Ljubljana: Založba ZRC, ZRC SAZU, 2004. From Autarky to ‘Barbarian’ Cosmopolitanism: The Early Avant-Garde Movements in Slovenia and Croatia. In: Mediterranean Modernism: Intercultural Exchange and Aesthetic Development. Ed. Adam J. Goldwyn and Renée M. Silverman. London: Palgrave Macmillan, 2016. 233–50. Venerating Poets and Writers in Europe: From Hero Cults to Nineteenth-Century Nationalist Commemoration. Studies on National Movements 3 (2015): 1–32. ‘Every Monument Erected by a Nation to Its Greats Is Erected to the Nation Itself’: Vodnik, Prešeren, and the Nationalization of the Carniolan Capital’s Topography. Neohelicon 41.1 (2014): 27–41. France Prešeren: A Conquest of the Slovene Parnassus. In: History of the Literary Cultures of East-Central Europe: Junctures and Disjunctures in the 19th and 20th centuries. Ed. Marcel Cornis-Pope and John Neubauer. Amsterdam: John Benjamins, 2010. 97–109. 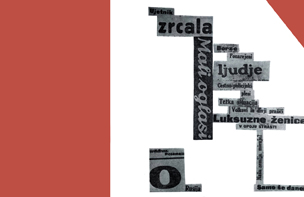 The Slovenian Interwar Literary Avant-garde and its Canonization. In: Europa! Europa? : The Avant-garde, Modernism, and the Fate of a Continent. Ed. Sascha Bru. Berlin: Walter de Gruyter, 2009. 36–48. Dr. Marijan Dović, born in 1974 in Zagreb, has studied comparative and Slovene literature at the Faculty of Arts in Ljubljana (graduated 1999; PhD 2006, supervisor Marko Juvan). Since 2000 he has worked as a researcher at the Institute of Slovenian Literature and Literary Science ZRC SAZU. He has published three monographs (Sistemske in empirične obravnave literature /Systemic and Empirical Approaches to Literature/, 2004; Slovenski pisatelj: razvoj vloge literarnega proizvajalca v slovenskem literarnem sistemu /The Slovene Writer: Development of the Literary Producer in the Slovene Literary System/, 2007, and Mož z bombami /The Man with the Bombs/, 2009) and a number of articles in Slovenian, English and other languages. He has also organised a number of conferences and edited several thematic volumes of Primerjalna književnost and collections.